These systems revolve around the use of cold water and some form of atomisation. Some degree of water treatment and a maintenance regime is desirable to extend the life of the plant and deal with health and safety issues that surround these type of systems. Like all types of system if they are designed, installed and maintained correctly they will give good long-term operation. The alternatives available include sprays, ultrasonic systems, spinning disc and evaporative. These systems have developed out of the spray washer that is still used for some industrial processes. These tended to operate using a simple pressurised water supply to an atomising head and spray into the air stream normally against the cooling. This would be prone to clogging and the performance was generally considered to be poor. Compressed air has now been introduced which dramatically increases the agitation of the water to create a very fine mist that does not depend on a blanket, in the form of the cooling coil, to help absorption. The introduction of compressed air has so advanced the atomisation process that some manufacturers have described it as ultrasonic. These systems can use raw or base exchange treated water but would then emit quantities of minerals into the air stream. For this reason they are more suited to de-mineralised water feed. These systems can be used in ducted systems or space application. There must be full water conditioning and control to prevent the development of legionella. These water treatment measures are fully described in the HSE Approved Code of Practice and Guidance for the control of legionella in water systems. The Humidity Group of the HEVAC Association has also published a Code of Practice for the design maintenance of such systems. The heart of the system is the nozzle, which would normally have an automatic cleaning cycle to keep the orifice clear and free of mineral build up. The nozzle can be of brass or stainless steel dependent on the water quality. The same nozzles would be used in the ducted and space application. The ducted application mounts a number of nozzles onto a header bar positioned across the full width of the air path. There could be multiple headers offset from each other dependant on the capacity required. Eliminators are normally positioned downstream of the calculated absorption distance to ensure no carryover of water occurs. The space application would have a range of single and double nozzle header arrangements that can be rotated for directional purposes. Each header arrangement would be mounted at high level around the space to ensure all the area is covered. The space application does not rely on an air path for dispersion. Water vapour will disperse naturally from a high to a low moisture content without the aid of forced ventilation. Control of the space system would be by a single humidistat in a designated area or an averaging arrangement across the whole area. The ultrasonic system uses transducers oscillating at a frequency of 1.7MHz to atomise water into an aerosol. Each transducer has a nominal output of around 0.6kg/hr and requires a considerable number to produce a reasonable output. There are two types of device available, one sits in the air stream and utilises the system air movement, and the other sits outside and pipes the moisture into the space and includes a fan arrangement within its own cabinet. The in-duct device has aerodynamic hoods over each transducer well, the open end facing in the direction of the airflow. The atomised water is induced out to entrain with the air prior to the next element in the air path. The 'fog' produced by this device is very fine and is absorbed very quickly into the surrounding air. As with all cold water systems the ultrasonic unit is best served with de-mineralised water to ensure no mineral particles enter the air stream or clog the transducer well. Again there must be conformance to the code of practice governing legionella and would require regular draining of the well if left inoperable for lengthy periods. The second type is a self-contained device that can be used to duct the 'fog' into an air stream or into a space. Because it is a cold water 'fog' and heavier than surrounding air it will have a tendancy to fall to the floor unless supported by an air flow. The very fine mist is absorbed into the surrounding air quite quickly although eliminators are sometimes used to ensure no carry over. These are relatively expensive to buy but very cheap to run as a stand alone humidifier. However, if water treatment such as softeners, de-mineralisation and or UV is required the initial cost as well as run costs will increase. As with all adiabatic systems the re-heat, if required can offset the run cost benefit accrued with this technology. The spinning disc type of unit introduces droplets of water onto the face of a rotating disc, the centrifugal force spinning the droplets to the perimeter through the teeth and into the air stream as a mist. There are variations to this theme where the disc is vertical and rotates at high speed into a shallow bath of water. Another rotates a drum at high speed around a spray nozzle. Control is relatively course and would normally be controlled by varying the volume of water introduced. De-mineralised water is preferred. The benchmark London water would require some serious filtration before the air is introduced into the space or water treatment to get rid of the dusting before it becomes a maintenance problem. Ducted and space applications can be considered from relatively low to high capacity ratings although the system does lend itself to the larger application. Relatively cheap as a first cost and cheap to operate and run, the expense will come with the water treatment to prevent dusting plus the health and safety regime required with all cold water systems. Again re-heat may also have to be considered dependant on the application. The evaporative system feeds water to the top cell structure, which then precipitates through the media. Air flowing through the media evaporates the moisture and takes it up into the air stream. This is quite a simple system to install and operate and tends to come as a self-contained cartridge that includes the cell material, water bath, pump, supply and drain controls. A number of different cell materials are available but a good reliable media would be glass-fibre treated with wetting agents that are non-toxic and non-organic. The water supply should be filtered as a minimum consideration as should the air to prevent build up of contaminants within the bath or on the cell structure. A UV lamp to the supply water ensures the water is sterile when introduced into the reservoir. Using de-mineralised water could be counter productive as it will be quite aggressive and attract airborne minerals and contaminants that could develop into long term maintenance issues. The system would be constantly replenished with fresh water over and above the evaporation rate and incorporate a bleed mechanism. The cell is kept wet at times of humidification, which has the effect of constantly washing the cell media to prevent a build up of contaminants or micro-organisms. These systems are available for medium to large applications, and are particularly suited to process applications requiring large amounts of air. Although relatively cheap as a first cost base item, the water treatment adds considerably to the system cost. They are cheap to run although allowances should be made for major cleaning or replacement of the cell material after a number of years operation. A temperature difference of 1.5ºC affects a target humidity of 50% by about 5%RH. 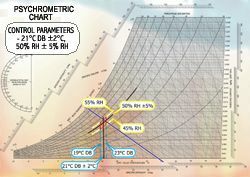 So when we specify 21°C DB +/- 2 ºC and 50% RH +/- 5% RH we are defining quite a considerable area of control as indicated on the control parameter psychrometric chart (fig 1). To control the humidity level we must first measure the amount of water vapour present in the air at the sensing point. There are two main types of sensor used: dew point and RH sensors. Dew point sensors tells us at what temperature condensation will occur if the air is cooled and is a measure of how much water vapour the air holds in absolute terms. The RH sensor measures the degree of saturation of the air on a scale of 0 to 100%. It is more common to use the RH controller in commercial applications and the condensation hygrometers in very close control applications. The oldest humidity control device is the simple humidistat. This gives relatively course control and is used for high or low limit safety devices within an uncomplicated control scenario. Times have moved on though and electronic devices are more prevalent and can be split into two camps. The capacitive device has a control band of 0-95% and the resistive has a band of 25-95%. All RH controllers whether mechanical or electronic have problems controlling at 95-100% RH and it is normal to use the dew point or condensation hygrometer for these high limits. The sling psychrometer tends to be used to measure or check internal or external conditions. Using a wet and dry bulb thermometer, they are rotated or exposed to an air velocity, readings taken and plotted onto a psychrometric chart. Electronic devices that do offer a more accurate measurement with the added benefit of being able to be re-calibrated are superseding these. Solar effects: direct sun light will give erratic performance of the system as the sun moves around the building. Difficult to diagnose when looking for reasons for bad performance. Draughts: supply air diffuser that may blow air directly over the sensor. The temperature gradient across the space will not be picked up if the control point is the supply air condition. There will be a further effect of air velocity over the sensor, which would take it outside its operating limits. Equipment: radiators, drinks machines, office equipment giving off heat, all of these will create a micro climate within the space. External surfaces: This could be more difficult to ensure against. Insulating the sensor from the influence of the cold or warm surface is a possible way of limiting this factor. Mounting the controller/sensor in the return air duct is another safe decision, but care must be taken to introduce an offset for the condition gradient across the space. There could be multiple return air points all converging on a common return air duct. Multiple sensing points will increase our ability to average or introduce supply air control into each space or zone. The common factor as we move through all the more elegant solutions is that the price goes up proportionally. Not necessarily what the client wants to hear. High limit overrides, mounted in the supply duct, should be positioned to prevent over humidification leading to wetting out within the air handler or supply air duct. A good rule of thumb is minimum of 4-5m of duct from the point the moisture is introduced. Avoid dead spots in the ductwork and if possible ensure the moisture is fully absorbed into the supply air. All sensors will drift out of calibration over a period of time typically 3-5%. They can also suffer from poor repeatability in the short term, slow response time, hysteresis or memory effects and coarse resolution. Regular calibration checks will identify bad sensors and with the right action will improve the system performance. Let's say the above can be added up by taking the square root of (3)2 + (3)2 + (5) = 6.6. We are reasonably sure the true humidity at any spot in the space is between 43.4% RH and 56.6% RH. If we take this theoretical control shift or sensing error and equate it to a theoretical build of say 5000 m3 with a design set point of 22ºC DB / 50% RH. If we apply our 6.6% shift so the measured set point is 22ºC DB / 56.6% RH there is a possible 33% increase on run cost for an electrode boiler humidifier. One must offset the possibility the shift is in the other direction and the measured set point is 22ºC DB/43.4% RH, in which case there would be a 33% reduction in cost. It's all down to whether the sensors are measuring predominantly high or low. So what are the running costs one should expect over the life-span of the various systems? Let's compare systems of 30, 60, 200 and 400kg/hr humidification load and a 15-year life span; winter heat operation with the system designed to be recirculating nominally 90% with 10% outdoor-air intake. Hours run figures are based on 30 weeks per annum, with 60% diversification, five days per week and 10hr per day. The calculations have used electrical power at 6p and gas at 0.01p/kW. Each comparison includes allowances for spare part, maintenance, service and ancillary equipment that would not be normally included in commercial office building. The costs also include for re-heat in the case of adiabatic systems as the design criteria is 22ºC DB/50% RH. Electrode boiler: operating on raw London water and includes three replacement cylinders per year plus the manufacturer's recommended maintenance intervals. Resistance or element boiler: assumes base exchange treated water is available on the same London site and includes the normal maintenance periods for this type of unit. Gas-fired locally generated steam: assumes the same base exchange treated water as centrally generated steam but an allowance has been made for a coil change after 10 years. Maintenance and service visits would be all as per the manufacturer's recommendations. Wetted media: includes for a reverse osmosis plant and UV light as part of the recommended water treatment and includes a media change after eight years. Spray system: includes a compressor and receiver set for pressurisation of the water, reverse osmosis and ultraviolet plants plus all the control for water and air filtration. We can see that all the four sizes follow the same pattern in terms of whole life cost except in the case of the 400kg system that shows a reversal between the locally generated and centrally generated steam. Through all this should be considered the incoming water supply. Water containing 500ppm temporary hardness particles in suspension would precipitate approximately 0.1 kg/hr of scale or calcium deposit when heated and boiled off as steam. Assuming no water treatment for the cold water spray or ultrasonic system, this value would still be relevant. Using the same hours run criteria as the comparative run cost we can calculate that 135 kg/annum of solid material would be collected in the boiler, if isothermal, or in the filter downstream of the spray if adiabatic. If no filter is fitted this dust would precipitate out onto the occupied workspace. This is a startling statement as a reminder that it is better to treat the water for optimum performance in accordance with the humidification device fitted than to add cost to address a problem of our own creation.